In the summer of 2014 I did it. I actually bought a chair to take backpacking. After many years of planting myself on logs, rocks, stumps, and a variety of other surfaces, I decided it was time to step up to something a bit more comfortable. I hate to admit it, but as I get older, I feel the pain of the trail more and more and back pain is something I can pretty well count on whenever I sit on a hard surface for any period of time these days. I actually think it was my trip to the Marble Range earlier in the season that pushed me over the edge. On that trip, I had built a decent rock seat for cooking and sitting by the fire with but I found that I just couldn’t be comfortable for more than a few minutes and decided it was time to check into lightweight chairs. The chair in question I settled on was the Helinox Chair One. While it’s admittedly not the lightest chair on the market, coming in at 900 grams (2lbs), I liked that it had four legs rather than two that some of the other lightweight chairs use. I figured this would be reasonable for packing along and would also serve well on canoe trips rather than bringing along a full size camp chair. Since it folds down to a relatively small size with its own case, it quite easily straps onto the outside of both my backpacking packs and fits easily into a stash bag while canoeing. I did manage to get lucky and score it on sale at Wholesale Sports for a good discount so that was certainly a nice bonus. I would have preferred the chair in blue, but as they only had camo available, that’s the colour I ended up with. My intention with the chair is not to take it on every trip, but really only where I don’t expect we’ll find much in the way of seating. 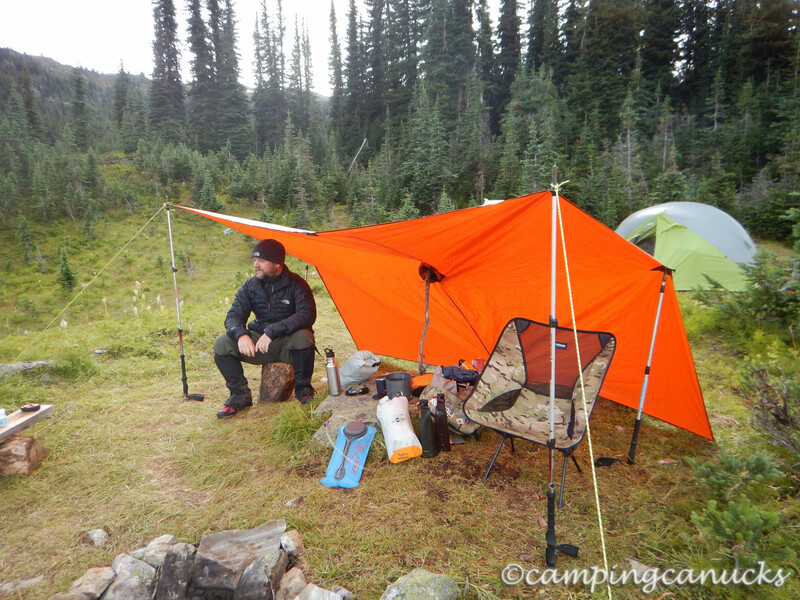 Many of the various national and provincial park backpack trips we do will often have tables and the like, so for those trips, I don’t bother. For the rougher and more rustic trips, where I fully expect nothing but rocks and trees, the chair has become an important piece of gear for me. Since it readily straps to the outside of my packs, it’s not very hard to bring along and doesn’t get in the way. The Chair One takes seconds to unpack and put together. As it’s constructed of some heavier duty Dac aluminum poles, it has a really solid feel to it once it’s assembled and is remarkably comfortable to sit in. The construction seems to be quite solid and I fully expect that this chair will last for many seasons of use as the seams that attach to the poles do not appear that they will give out easily and the seat itself is built from a heavier fabric. It’s hard to find many complaints with this chair, although I have found that it tends to sink into the ground if the ground is soft at all, and I have almost fallen over backwards a couple of times when the rear legs have sunk in. On harder or rockier surfaces, the chair sinking is not an issue. Finding a somewhat flat surface becomes the challenge in that case. I understand this chair is not for everybody as I know that there are people who will balk at adding an extra two pounds of weight for something that is largely a luxury item. But as all my gear these days is lightweight and my pack is typically around 25 lbs for a two or three day trip, I don’t have a problem with a couple of extra pounds attached for the shorter trips. On longer trips where weight is more of a concern, I would likely skip bringing the chair along. 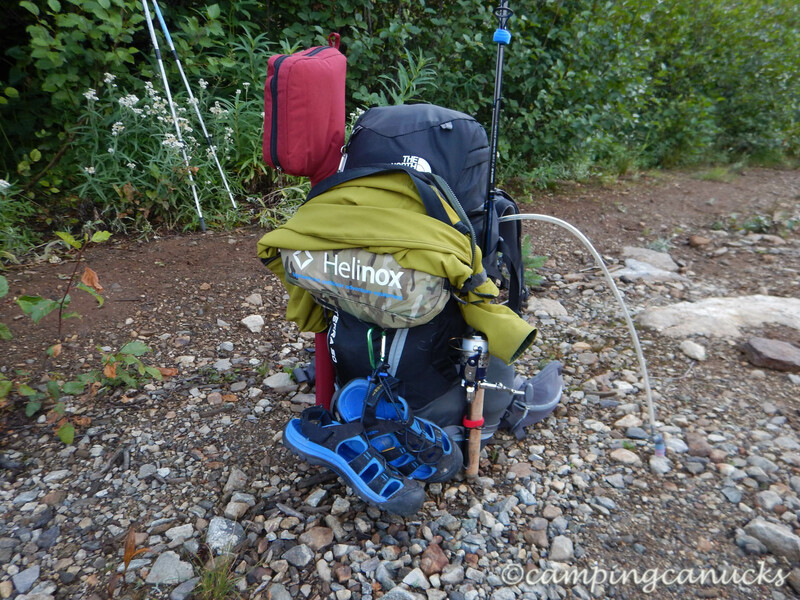 I would certainly recommend the Helinox Chair One for anyone who is looking for an upgrade from a rock or log while backpacking. 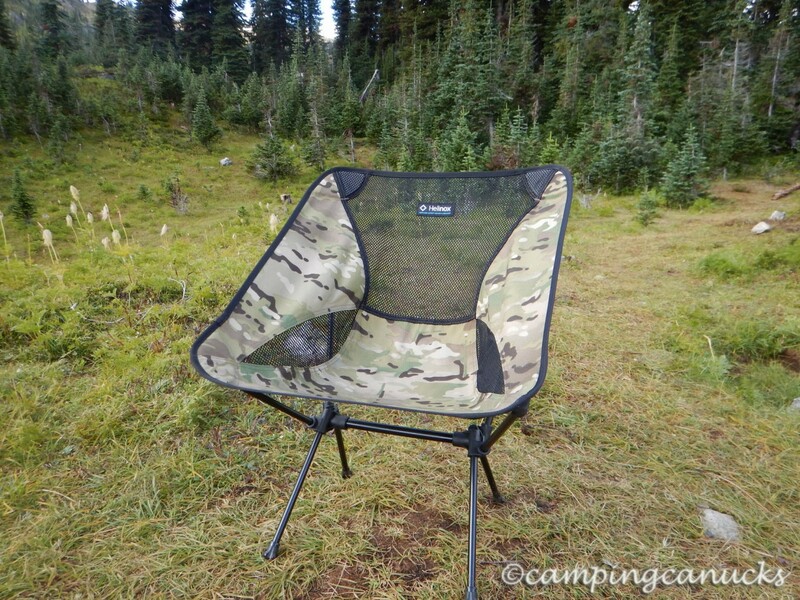 Of course, if you’re canoeing or car camping and weight is not a concern, this is still a great chair to bring along instead of a full size camp chair.